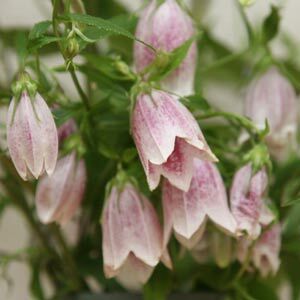 A pretty campanula with largish white bell shaped flowers flecked with pink, Campanula takesimana will reach around .5m in height and is an excellent addition to the cottage garden of the general garden border. Also known as the Korean Bell Flower. Best suited to cooler areas – see below. Distinguished by the long bell shaped flowers, a few varieties are available, mostly differing in flower colour. Although this is a most attractive bell flower this is a vigorous species that will spread by underground rhizomes as well as self seed. Cooler climate are better suited where growth seems to be restricted. Can be grown in a container and deadheaded if spreading is a concern. Spread – to .7m. These are a clump forming perennial and will send out runners in good conditions. Flowers – Elongated bell shaped, pink to white in colour, marked with a flecked maroon interior. Position – Full sun to part shade. More protection from hot afternoon sun in warmer climates.